Here's a reprint of the first edition that came out more than 10 years ago. They have the same page number so the content should be the same, but don't quote me as I don't have the first edition. This is a large 128-paperback artbook published by Dark Horse. The paper used are low gloss and thick, occasionally interspersed by matte red pages. The book starts of with an introduction by R.C. Harvey who recounts the rise of Frank Miller and his art since the Daredevil days in late 1979. It's an interesting read, interesting enough that I hope one day there will be a Frank Miller artbook and biography. The artworks featured are a selection of covers and pages from the various Sin City main and short stories. While most are actual finished artworks, there are also some preliminary pencil drafts, and layouts indicating areas to be inked. The red pages mentioned earlier shows off rough sketches but the page is only one side with the other wasted as blank. Unfortunately, there's no commentary included except for short credits. Frank Miller's film noir inspired style of art is very powerful. The use of light and shadows, stark backgrounds, are fantastic. Flip through a few pages and the Frank Miller style is easily recognisable. Bulk of the artworks are in black and white, while the last few pages (mostly from Hell and Back) are in colour. The selection is quite random. If you actually search online for Sin City comic art, you'll see that most of the images that turn up are good enough to be featured. A lot of good artworks and pages are included, and a lot are also not included. Frank Miller's art is fantastic. Between looking at them online versus getting this book, the extras would be the few rough sketches and layout pages. 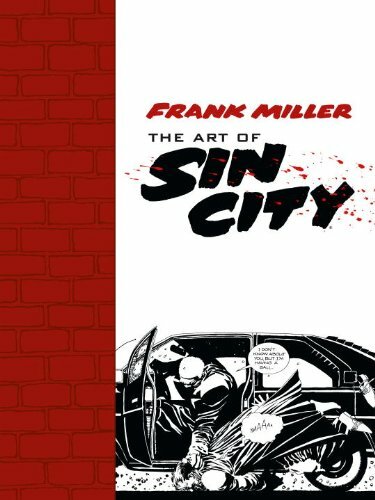 If you want everything, then you should get the humongous omnibus edition Big Damn Sin City which I regard as the real Sin City artbook plus you get the stories as bonus. Overall, this book could certainly do with additional writeup into the process of creating the Sin City comics. Without any commentary, it's not quite different from the comics that also feature a good deal of great art. And the artworks aren't arranged any order in this book. So if you already have the comics, you can probably give this one a miss unless you really think the handful of sketches and roughs are worth your money. If I can only buy one book, I would get the Big Damn Sin City even though that's much more expensive, but that has the entire series in 1360 pages.